After our big HP feast, we had a low key weekend and got a few things checked off of our project list. We have several arches in our house and we painted the insides white (same as ceiling) to make them stand out a little more. The result is great and took minimal effort. 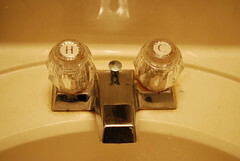 We also replaced the faucet in our guest bathroom, a task that took far more effort than we anticipated. Oh, and that said, "we" really means Austin in this case since all I was capable of doing was handing him tools and parts (getting better at tool names and locations but parts were all "silver thingy with a white blob on it."). The bathroom is very small so that was the main problem, both physically getting under the sink and dealing with a compacted sink set up. Anyway, Austin persevered and here are the results. Apparently crystal knobs were in in the 90's? Or just the cheapest option? 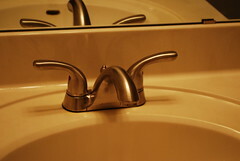 New faucet in brushed nickel. Light switch plate cover made by one of Austin's aunts. 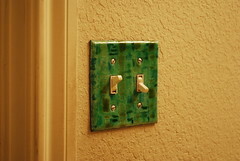 thanks for using my switchplate!